Do you need junk hauling to get rid of old items before a move? Are you looking for a demolition company to take down a rickety structure? Do you need disposal services for old appliances, furniture, or electronics? For these and many other types of rubbish removal projects, your best bet in the Schenectady area is JDog Junk Removal Capital Region. Operated by local veterans, our junk removal business is serious about delivering top-notch workmanship, courteous customer service, and quick turnaround times. Let us implement your garbage removal mission with military-style precision and honest pricing on every job. It’s a win-win way to clean out your clutter while simultaneously supporting area veterans. Call us today to get started! Getting rid of unwanted items is simple when you have our disciplined veterans working for you. Instead of trying to round up friends and family members to help with junk hauling, we can be there whenever you need us to clean out unwanted items and dispose of them properly. Plus, we keep you safe from unexpected incidents and injuries, since we’re well trained to handle not only the heavy items but also the risky jobs such as tree debris removal and exterior demolition service. We’re a fully insured junk hauling company, and we have high standards for safety and quality. As for affordability, you’re not likely to find another junk removal service that cares as much as we do about fair and clear-cut pricing. Whether you hire us to tackle a basement cleanout, dispose of old computers, or carry out unwanted furniture removal, you can sit back and relax, knowing the price you get on your free estimate will be the price you pay. Unlike some dumpster companies and other Schenectady-area junk pickup services, we don’t believe in tacking on extra fees based on weight overages or types of materials. From latex paint to shingles to tires and so much more, we include it all in our junk removal services with full transparency regarding labor and removal costs. Why not call us today to get an estimate at no charge?  At JDog Junk Removal Capital Region, we’re pleased to work with property owners, contractors, real estate professionals, and anyone else in the Schenectady metro who is looking for fast and affordable junk removal from qualified professionals. We’ve been in business since 2011, and we run a tight ship when it comes to junk hauling services for homes and businesses alike. Pick up the phone now and call our local veteran team to experience the very best in property cleaning services. We look forward to speaking with you. Copyright © 2019 JDog Junk Removal Capital Region, all rights reserved.